Walking into Tokyo Table, we were welcomed by a woman of, erm, rather sumo wrestler proportions. This made me wonder what kind of liberties the management allow their people with the local industry standard of meal provisions for employees. This is an all-you-can-eat place. Omega-3 essential fatty acids found in fish, especially oily fish from cold waters, makes it an incredible source of these heart-strengthening, inflammation-reducing, cardiovascular disease-preventing, brain-boosting, cholesterol-lowering, depression and anxiety-alleviating, skin-moisturizing. . . *pant, pant*. . . life-lengthening nutrients. Knowing all that and being able to tell the difference between sushi, maki, temaki and the many different variants and versions of each doesn’t guarantee that you are eating healthy. While seafood and vegetable or fruit combinations generally cover your Grow and Glow food requirements, these usually also rest on a bed (or even wrapped in a comforter) of the Go food overkill of rice. Starch. Sugar. 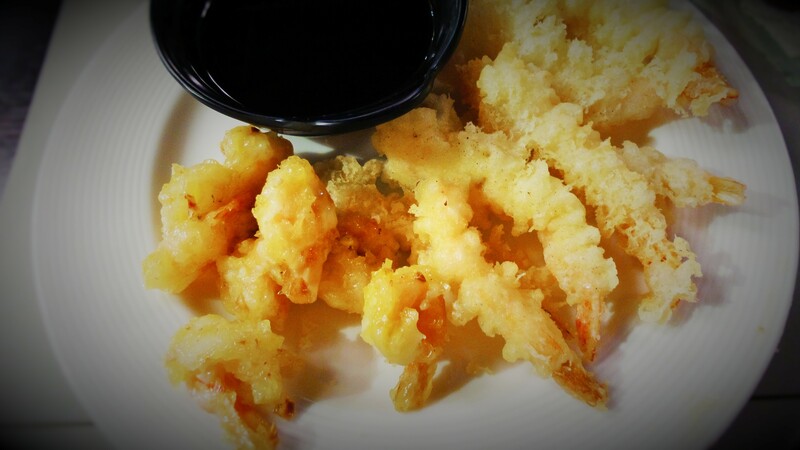 Factor in sauces, mayonnaise, cheeses, deep-frying for “crunchy” variants–and the panko breading that goes with that, and you have an easily-downed tube of calories. I’m not stopping you. I’m not stopping myself. Like the Surgeon General’s Warning on a pack of cigarettes, we will, of course, turn a blind eye to all that. This, by the way, is in no way an endorsement for smoking. I don’t smoke. I just eat. From the generous spread at the Tokyo Table, here I assembled a sampler of one of each kind of their maki’s. Of note would be the Red Velvet Roll (maki with maguro sashimi on top), Salmon Sashimi Roll (they could have gone fancy and called it Orange Velvet Roll taking cue from the former), Toasted Sesame Maki, Ebi Tempura Maki (ebi tempura plus maki is sorcery), Salmon Crunch Roll, Anchovy Roll(it’s “dilis“-cious! 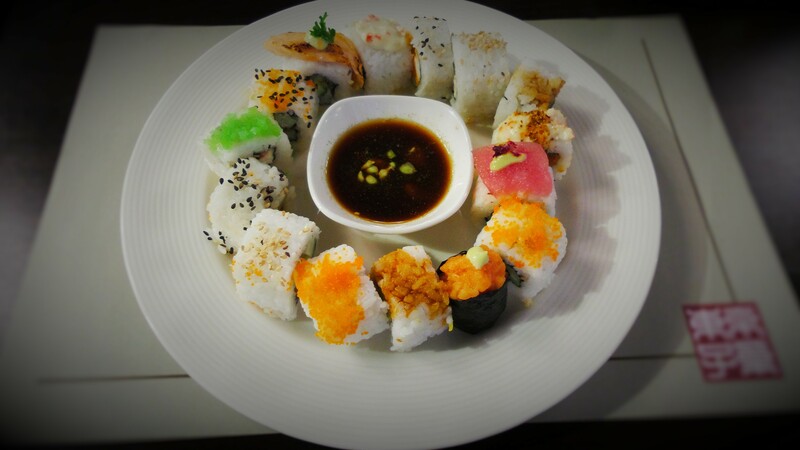 ), Philadelphia Maki (cream cheese!) and Salmon Skin Maki. I found myself looking for the crunch in the Mango Crunch Maki. Although it didn’t exactly disappoint, the Tokyo Table Signature Roll didn’t exactly stand out for a signature offering either. The ubiquitous California Maki’s were as they are just about anywhere. Points for using Masago for the alternative second though that didn’t prove much different from the usual orange Tobiko apart from the green color. The rest just rolled past my tastebuds like popcorn when one is glued to a movie. This would have just been a short note on my plate of makis but I obviously had to (well, no, not really. More like wanted to) eat my PHP750’s worth. Beyond these, Tokyo Table also has Tempuras and other fried items, a rather confused Teppanyaki section which included spam, cocktail hotdogs and bulgogi meats (here Tokyo is just an arm’s length from Seoul) and, strangely, a Chinese section which seemed to outnumber the Japanese selections. Ah, the Revenge of Nanjing! As we arrived about two hours into their lunchtime operations, no good photos of the Teppanyaki and Chinese sections could be taken as earlier waves of Kaiju came before us. I’ll cover those sections on my next visit. 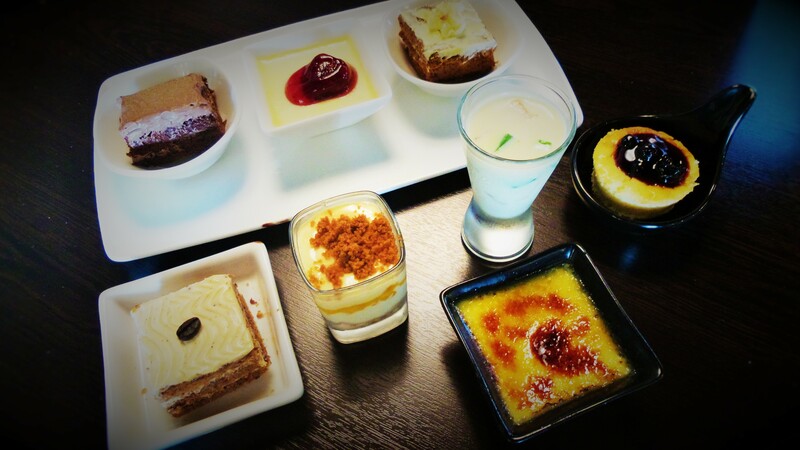 The dessert section of considerably numerous choices was also strangely non-Japanese with Sans Rival, Mango Pandan, Cheesecake, Crème Brulee, Mango Float, Coffee Sans Rival, Dark Chocolate Sans Rival, Panna Cotta, Chocolate Moist (huh? LOL) and Cinnamon Cupcakes. Their three versions of Sans Rival could easily be rivalled by most neighborhood panaderia offers, what with the soggy, chewy wafer layers. The Dark Chocolate one packed quite a chocolaty punch though. The Cinnamon Cupcake was a winner. Great ratio of frosting to cake and sugars held back on both. The Crème Brulee was thankfully not pre-torched as in most buffets. You get that little prep show before they hand it over to you. It was deliciously creamy and, given its condiment saucer serving, proved to be quite light. The Cheesecake seemed to have sat in the display chiller a little bit too long as betrayed by a cracked, dry exterior. I drowned it in my soy sauce dipping bowl so I wouldn’t have to pay extra for leftovers. With the rest of the dessert items coming across pretty hmmmkay, I was ready to cleanse my palate with a good cup of black. I’m sure I could still squeeze in liquids. I’m outta here. 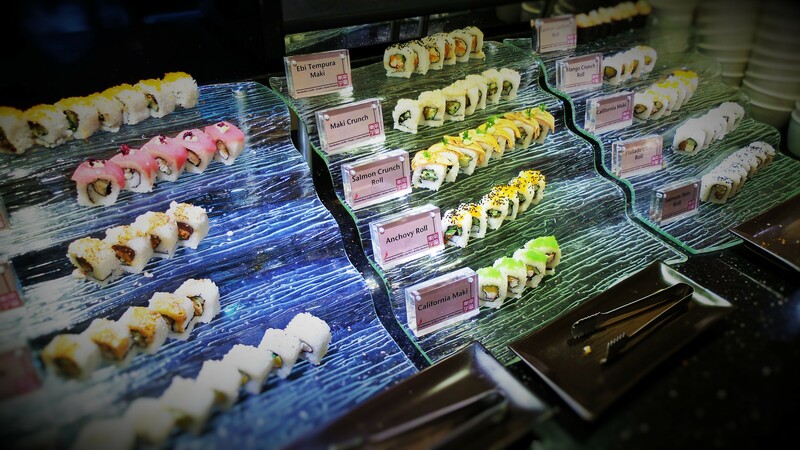 This entry was posted in Uncategorized and tagged all-you-can-eat, Food, foodporn cebu, hamburgero, japanese, maki, ramen burgers, Red Velvet, sushi, Tea, tempura japanese grill, teppanyaki, Tokyo Table. Bookmark the permalink. jeez louis, you do some brilliant writing! looking forward to reading more. food looks delicious – and from the small subset of posts I’ve just read, I might have to put the Philippines on my travel go-to! To paraphrase “The Islands’ ” current tourism ad campaign tagline: EATS’ “(It’s) more fun in the Philippines!”. Make that a definite go-to and of the 7,108 islands to choose from, make sure you come to mine, the Visayas Central Hub and Queen City of the South — Cebu!